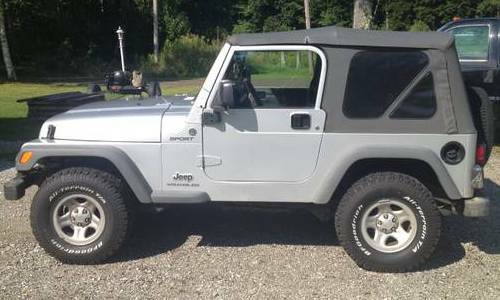 Message: 2005 Jeep Wrangler TJ Sport edition with only 60,000 miles. It has the 4.0 Straight 6 Cyl with an A/T transmission. Leather wrapped steering wheel, cruise, A/C, AM/FM/CD, manual windows. Interior is clean. Just had a set of 4 31X10.50X15 BFG A/T’s put on with less than 1000 miles on them, as well as new front axle joints, and a new oil pressure sending unit. Oil changed regularly. Comes with a soft top that doesn’t get taken off much. Soft top does have a little rip in it by the driver’s door (see pic), and has tinted soft top windows. Reason for selling is to get out of the payment and we need a more family oriented vehicle, otherwise we’d keep it. NADA has it listed for $14,900 and KBB has it at $16,900 in good condition. Sorry no trades. Any questions can be sent via email, which I do get on my phone. Please include name a phone number in the email, simply to weed out spam. Thank you. This entry was posted on Tuesday, September 24th, 2013 at 2:02 am	and is filed under Maine, United States. You can follow any responses to this entry through the RSS 2.0 feed. Both comments and pings are currently closed.